My Arduino Projects: smARtDUINO Arduino projects without the wires! smARtDUINO Arduino projects without the wires! So I just backed this new project on Kickstarter.com called smARtDUINO. 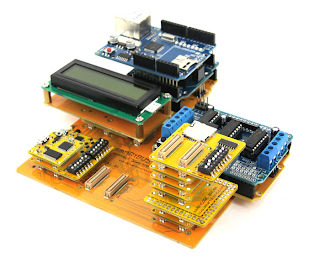 It's an Arduino compatible system that uses a couple of nice connectors to allow you to connect modules together to do prototyping without wires. You snap the processor (there are a couple choices) onto a power module and snap that to a bus connector. From there you can snap on LED's or switches, relays, GPS modules, all sorts of things. Even to the point of connecting multiple processor cores to one unit! It's really pretty cool, I can't wait to get my hands on my starter kit and see what I can do. They even have a module that will allow me to connect the Digispark (see post below) to the system and a board that will give you the full Arduino pinout so you can use Arduino Shields with the smARtDUINO. Update - January 2014: Finally after over a year of waiting (Estimated delivery was November 2012) I got my smARtDUINO parts. This was the project that killed Kickstarter for me. I'll never back another project on Kickstarter for sure. And if I am ever fortunate enough to meet Dimitri Albino in person, I hope to kick him in the man parts. This creep took $157,571.00 dollars and made a lot of promises only to follow them up with a lot of excuses. There were claims of Fraud and Misrepresentation. My plan is to one day assemble something out of the parts and then dump it all in a blender and grind it into little pieces of yellow dust. I'll do my experimenting using some other version of Arduino. For now the parts sit in my basement still in the bag. I lost all interest in fooling around with this garbage months ago.